As I transfer individual figures from the work bench to the ranks of my Anglo-Danes, their strength increases more and more. 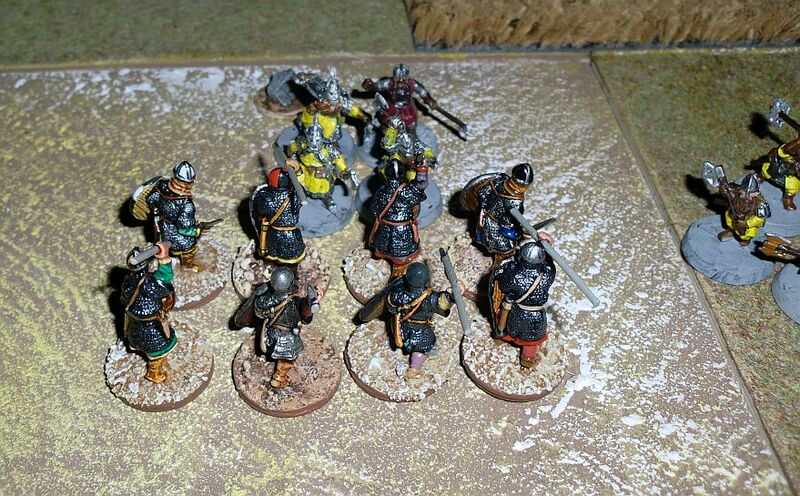 Now the Anglo-Danes already can muster all but the second unit of warriors and the warlord himself. 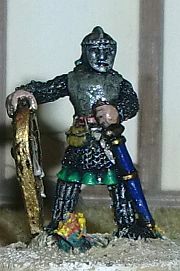 As a substitute for him I dug out a heavily mailclad figure from the Metal Magic 25mm fantasy range that I have painted decades ago. This will pose as Canute Sweynsson, King of England, Danemark, Norse and parts of Sweden. Also known as King Cnut the Great this character is a powerful Anglo-Danish Hero of the Viking age from the SAGA rule book. He generates 7 SAGA dice (Sic!) 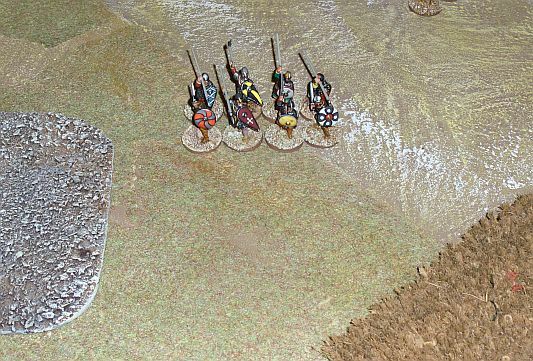 as long he leads his warband, and he can opt to use the Viking battleboard with any or all of the SAGA dice. This really is powerful! Normally this would give the warband only 5 SAGA dice, thus here you see how the Anglo-Danes benefit from Cnut’s special abilities. 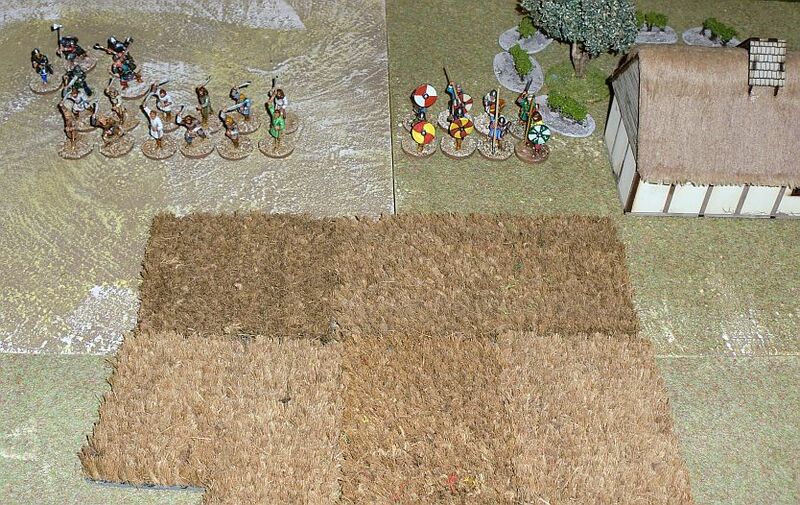 The terrain is quite restrictive with two pieces of fields/crops in the left and right centre, a house on the left and a swamp on the right of the Anglo-Danish position. 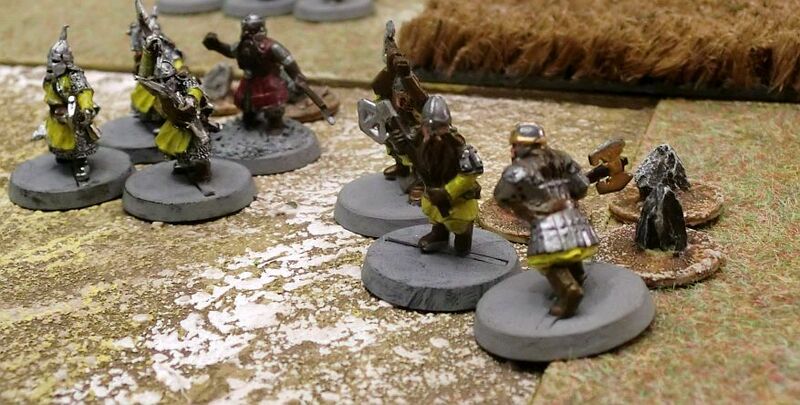 The Khazad start the battle by pushing forward their bowmen. 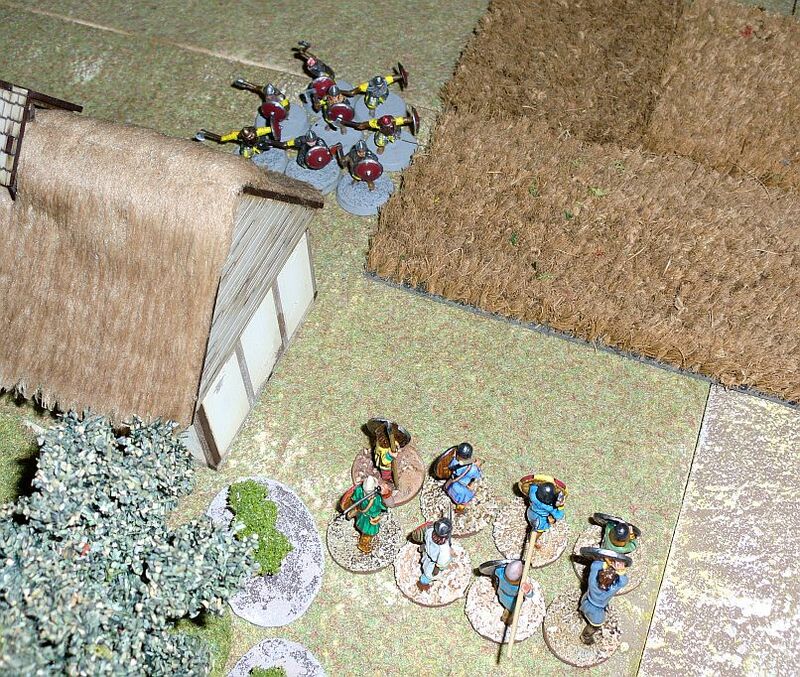 They suffer heavy casualties from sling shots in round 2 and 3 in the skirmish with the Anglo-Danish Gebuers. The Khazad use their abilities to advance on all sectors of the field of battle. The one handicap the Dwarfs have is the short pace of advance. They only move “S” on each activation, restricing them to “VS” in uneven terrain. Their advance on the Anglo-Danish left is only a distraction and developes into nothing more than a demonstration of force. The advance of the Dwarf warlord and his Naugrim bodyguard in the centre is far more threatening. The Geburs take out one of the Naugrim but now have to fall back exhausted. Nonwithstanding the warlord decides that his Naugrim bodyguards are to valuable to be wasted and lets them go hide in the crops. One only can imagine what sagas will be told in the halls of Khazad-dum on this specific feat of prudence! 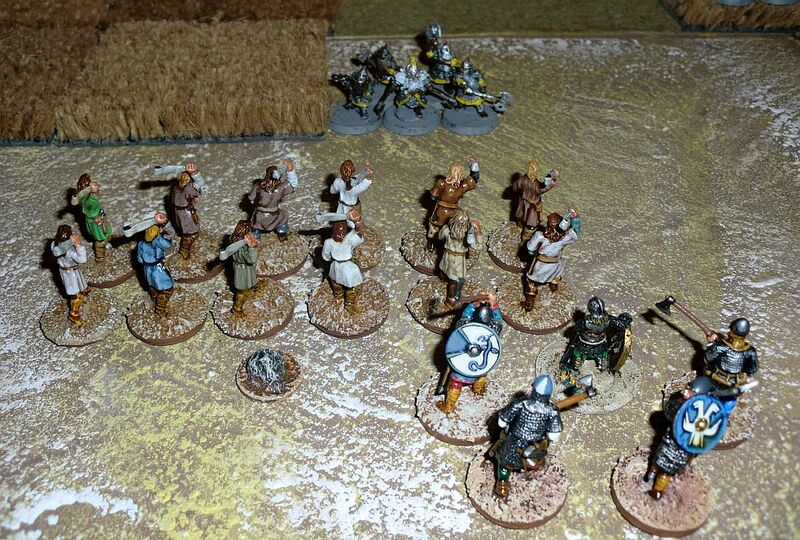 The drama unfolds on the Anglo-Danish right wing when the large Huscarl unit attacks the Sigin-Tarag elite. 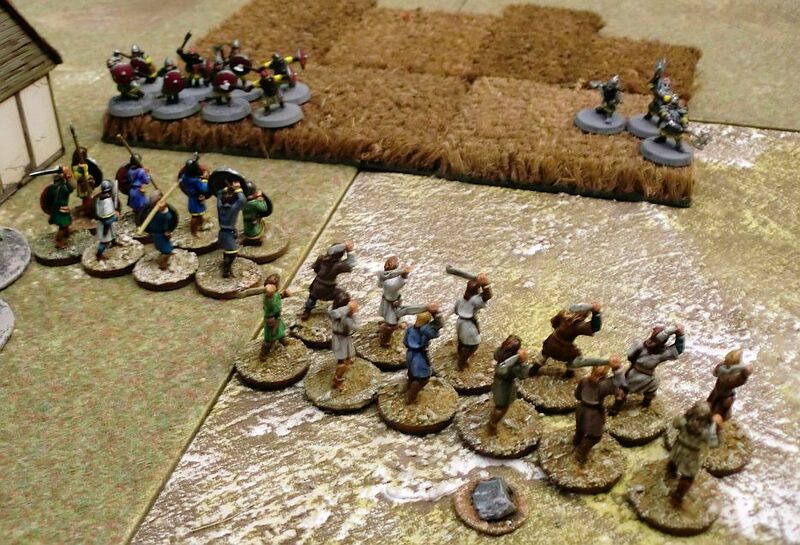 Due to the special rules for both the elite units involed the battle rages for two combat rounds involving a total of Anglo-Danish 32 attack dice vs. Khazad 12 attack and 12 defence dice plus some abilities from both battle boards. This resulted in no casualties, one fatigue each, and a push back for the Huscarls. Then the Sigin-Tarag attack with their throwing axes killing two Huscarls. 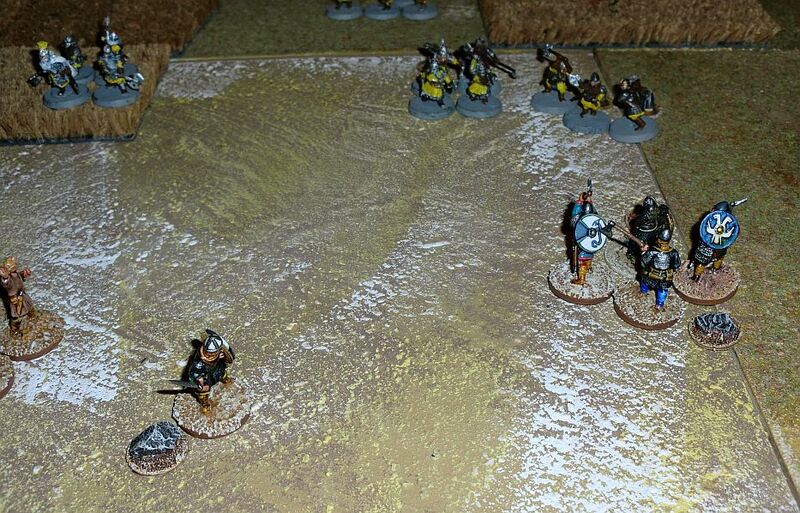 Finally the Azaghal with their two-hand axes charge into the flank of the Huscarls. This killed all but one of the Huscarls this delivers the coup de grace to the elite Anglo-Danish unit. Cnut and his bodyguard retaliate on their part charging into the now exposed flank of the Azaghal. All but three Dwarfs are killed, and the unit is pushed back exhausted. Cnut’s last option is a charge with his bodyguard into the Sigit-Tarag. As this also fails to produce any favorable results, he has to concede the battle. The Anglo-Danes did not use the Viking battle board. Against the stubborn and highly resilient Dwarfs this could have made a difference. Anyway, this was an interesting and very absorbing wargaming experience soon to be repeated.